The sun was out and shinning at last weekend’s market. 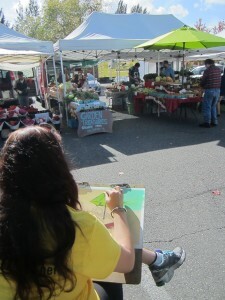 Artist Angela Kelly took full advantage of that sun, and the festive environment of the market. 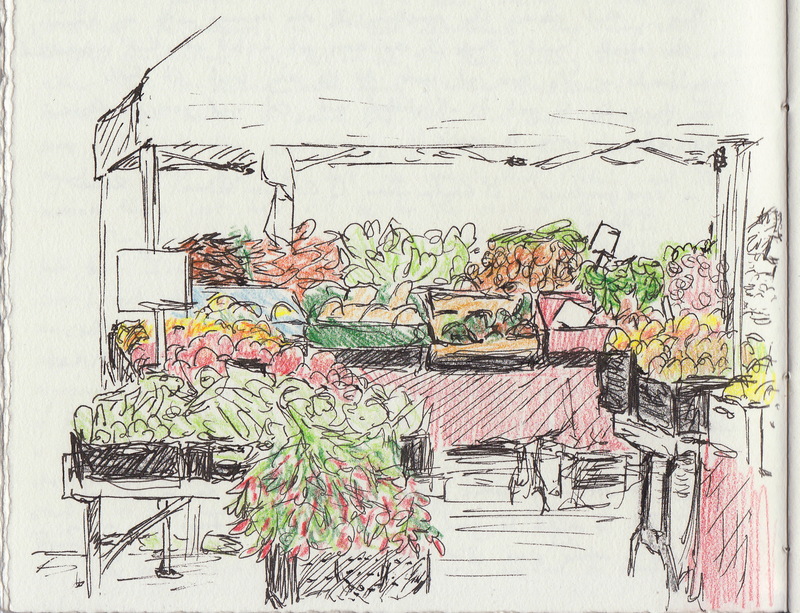 The sun was out and shinning at last weekend’s Farmer’s Market, and we had something special happening to take advantage of all that sun: sketch artists joined us in the market to live-sketch what they saw! 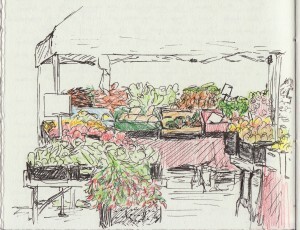 As folks shopped, conversed, and stocked up on veggies for the week, a small troop of drawers, painters, and sketchers documented it all. Upstairs in the Commons, the Shoreline-Lake Forest Park Arts Council hosted three hands-on art tables where shoppers could stop and try their hand at several art projects. All of this was part of the annual Lake Fores Park Sketchcrawl, which happens yearly in October. Scroll down to enjoy some photos of the artists at work, and the end results of their labor. Join us this Sunday, October 18, from 10am-3pm for our last regular market in the 2015 season. We also have two special Winter Markets which include both our regular Farmer’s Market (outside in the normal location if the weather is nice, inside the Commons if it’s not! ), and special Art & Craft market located in the lower level of the Town Center. 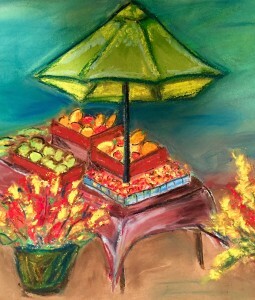 Angela Kelly is a Shoreline Artist working in chalk and encaustic (painting with wax). She recently showed her art at the Shoreline Arts Festival where she won best in show for her encaustic landscape titled Fall at Leprechaun Lake. 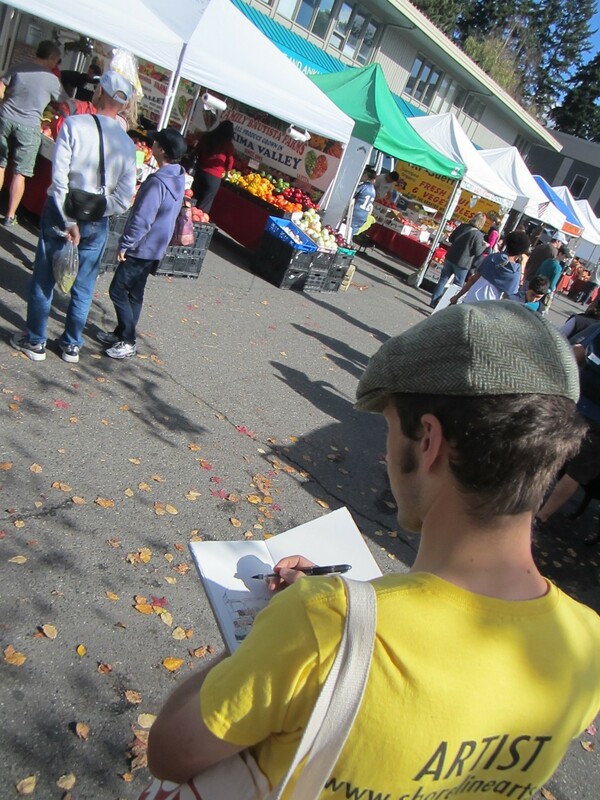 Charlie Capp is a graphic novelist living in Seattle, and one of the rostered artists for the Shoreline School District. He recently completed a residency at Brookside Elementary where he taught cartooning in 22 classrooms. Previous Post: A New Director at the Commons!